The Ford Figo Aspire car is scheduled to be launched in the month of August. Ford dealers across selected selected cities in India have already started accepting bookings for the upcoming compact sedan – Ford Figo Aspire. Some of the Ford dealers in Mumbai have started the booking process with an initial payment of 50,000 INR. Since the car is pending launch, there is no information on the actual price tag of the car. The Ford dealers are also offering full refund on booking amount if a customer decides to cancel. Ford Figo Aspire is a compact sedan, you can expect the price range to be close to Maruti Suzuki Swift DZire, Honda Amaze and Hyundai Xcent. Ford is offering the Ford Figo Aspire with 2 engine options- one being a 1.5-litre TDCi diesel and the other is 1.2-litre TiVCT petrol. The diesel engine of Ford Figo Aspire is similar engine as the one which powers Ford EcoSport and Ford Fiesta. The 1.2-litre petrol unit is something new. Ford’s upcoming sub-compact sedan shall as well get a choice of 2 transmissions: 5-speed manual and 6-speed dual clutch automatic transmission. The automatic transmission of the car shall be offered only with the 1.2-litre petrol model in the Titanium trim. Ford Figo Aspire’s list of safety features includes 6 airbags (including airbags for the driver and front seat passenger also side & curtain airbags), Hill Launch Assist, perimeter alarm, , Electronic Stability Program (ESP), Anti-lock Braking System (ABS) and Electronic Brake Force Distribution (EBD). 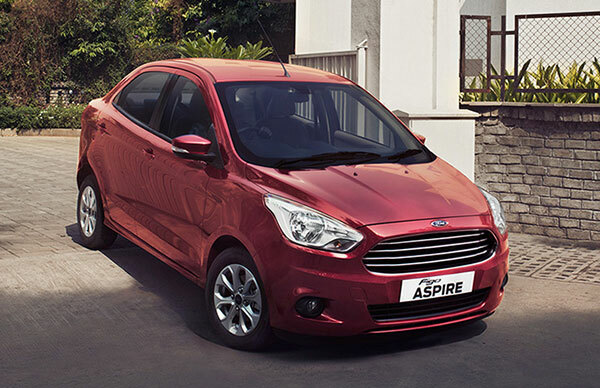 Are you booking the new Ford Figo Aspire?